Minty Citrus Gremolata is a fresh twist on the classic Italian gremolata… Its fresh flavors will sing atop a simple grilled salmon steak or fillet! My wandering has me in Ollantaytambo, Cuzco Peru as I type this post! At the halfway point of 4 weeks in the Andes in Peru, I am at once overwhelmed by its austere beauty, terrified by the drivers and roads we’ve traveled, amazed by its history and Inca culture and archaeology, and delighted by its cuisine… I am looking forward to editing photos, creating new recipes, and bringing you a taste of this rich and beautiful country in the weeks ahead. Gremolata is a chopped herb condiment typically comprised of parsley, lemon zest, garlic, anchovy, and sometimes olive oil. It is a traditional accompaniment to the classic Milanese special dish Ossobuco. Of course there are infinite variations on the recipe! I opted to go with a less-than-traditional recipe for my Minty Citrus Gremolata because I can. Bloggers privilege 😀 I’ve never been one to post classic or authentic recipes; I love to play with my food, remember? I have always had a love affair with citrus and mint, and it seemed to be a natural pairing with a simple grilled salmon steak or filet. Gremolata is so quick and easy to make, and does not require any unusual or hard-to-find ingredients. I use lime, tangerine, and grapefruit zest in this one, but feel free (and confident) in changing it up. With the addition of olive oil, it may be more like a pesto, but I like the way it works as a topping for the salmon. This beautiful main dish can be on your table in 15 or 20 minutes. 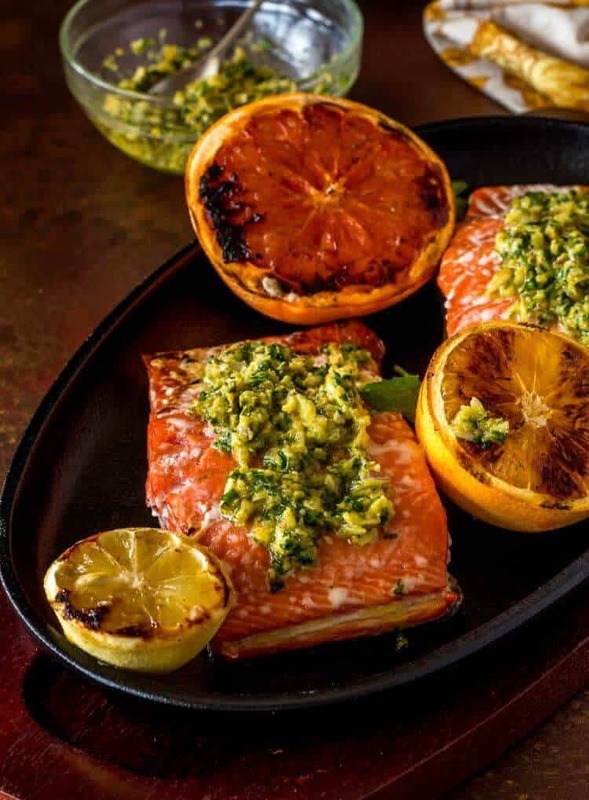 Make the gremolata while the grill preheats, grill the salmon, then top it with a dollop of Minty Citrus Gremolata. We love it with grilled asparagus and rice pilaf. Don’t forget to chill a crisp white wine! I regularly hear “I don’t like fish.” ARGH! How is it possible to reject an entire type of protein and the infinite variety of preparations? My response is typically “you have not had good quality fish prepared by a good cook.” I have at least one close friend that agrees with my thought process on the subject as she grew up thinking of fish as fish sticks… Is it any wonder she thought she didn’t like fish? 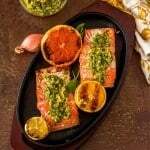 I hope you’ll give my Minty Citrus Gremolata with Grilled Salmon a try! If you just can’t “do” fish, then try it atop grilled chicken or even a lamb chop. Gremolata is definitely a great way to dress up simple grilled proteins! 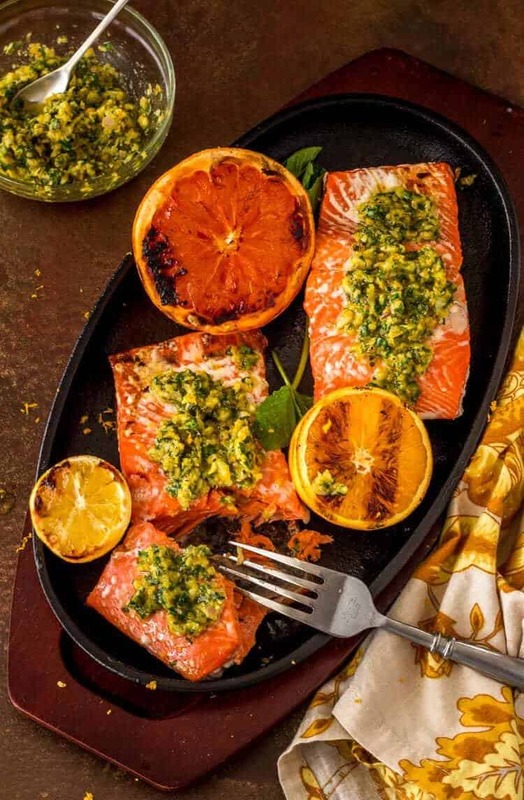 Minty Citrus Gremolata is a fresh twist on the classic Italian gremolata... Its fresh flavors will sing atop a simple grilled salmon steak or fillet! Add olive oil to desired consistency. Set aside. Preheat grill to medium-high. Season salmon portions with salt and pepper. Place salmon portions and citrus halves on grill. Cook until salmon is medium (or to your preference) and citrus has nice char marks. Plate salmon. Top with a spoonful of gremolata. Serve citrus alongside to squeeze overtop. Macronutrients (approximation from MyFitnessPal): 477 calories; 30 g protein; 2 g carbohydrates; 38 g fat. Serving size based on 5 ounces raw salmon and half the gremolata. Awww, so happy you are enjoying your travels through Peru. Can't wait to enjoy your tasty creations born from those inspiring experiences. This Gremolata looks tasty. Thanks for sharing. Peru was awesome Cindy, just as you said :-) We saw and tasted so many wonderful things, but I think the traditional pachamanca forever changed me. The Quechua culture and its people are so rich! I am looking forward to putting my "spin" on some of the dishes we had there, and even considering returning with my husband next year. The University has an ongoing program in the Andes, and he plans to continue taking Honors students on Studies Abroad... Yippee!